The Ridgeway, something in the region of 5,000 years old, was a trading route spanning from the Dorset Coast to The Wash in Norfolk. It is now a National Trail in the region of 87 miles long between Ivinghoe Beacon, near Aylesbury in Buckinghamshire, to Overton Hill, near Swindon, in Wiltshire. This race was to finish in Avebury instead of Overton Hill. 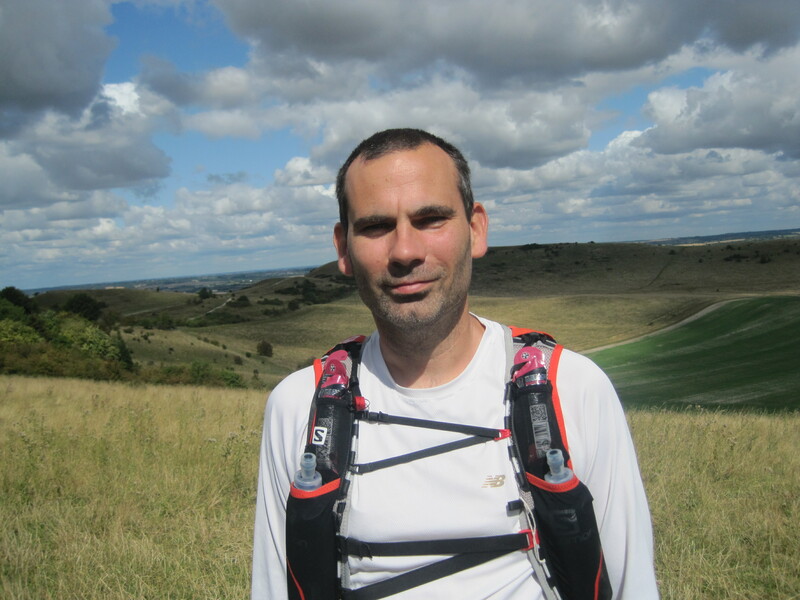 The first time I ran the Ridgeway was 2012 over three days and I remember thinking to myself – could I run the Ridgeway all in one go, to which the answer, which I vividly remember, was NO! Strange then that a little while ago the credit card came out and I entered the TRA 86 Mile Challenge. I trained pretty well throughout the year, but summer holidays arrived and, whether I’m making excuses or not, I just didn’t train very well in the month leading up to this race. Not only running, but gym core work went out of the window somewhat. I also managed a cake or two on holiday with an ice cream chaser so a little paunch was born. So, not the best preparation, but I felt fit enough, I’d never enter it if I didn’t. The race had two start time options, one at 10am and one at midday. Tim Mitchell (RD) had put the race in for UTMB points with a delightful 3 points awarded as a result, but you had to start at 12 to collect the points, so a midday start it was. I hadn’t started a race so late in the day before now, usually they start at some ungodly early hour, so normally I don’t sleep for fear of lying in, wedge a ton of porridge down my throat then start the race still half asleep. So a midday start meant a lie-in, so to speak, but I wasn’t sure how to fuel, as my porridge may have worn off by midday, so I made a pasta salad in preparation. I can’t say I was in the mood to eat it, but I forced it down anyway. It’s been a pretty hot summer and I’ve taken part in a few races trying not to melt. Thankfully the conditions for the Saturday and Sunday of the race were absolutely ideal. 15c or so, and clear skies at night – maybe a little chilly, but providing I’ve got my drop bag filled with suitable warm stuff, it shouldn’t be a problem. My wife and three children saw me off and left before the start – no need to hang around. I saw Neil Thubron (the XNRG RD) who was racing and said hello to him. It wasn’t too long before we had the race briefing and soon we were heading to the start from the car park – I was worn out before I got there! The race started at 12 and I just stayed at the back. 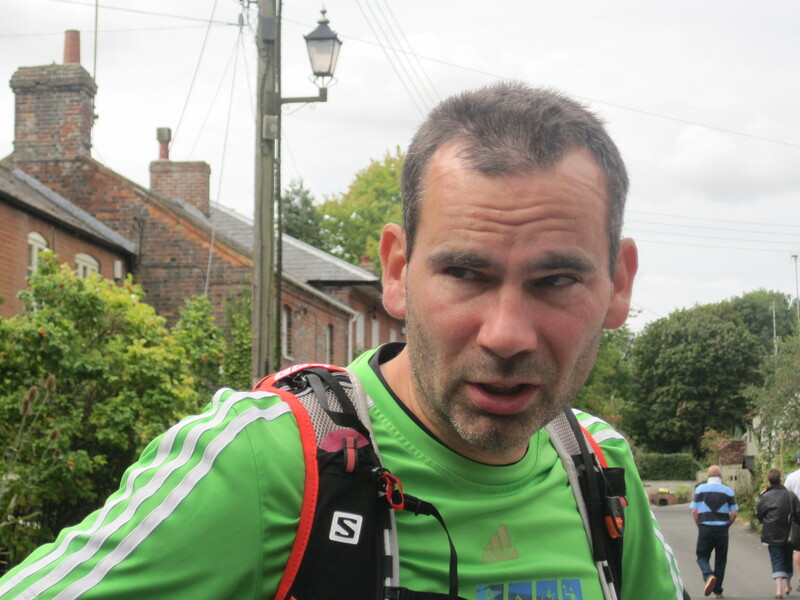 I was going to take this one very steadily – the furthest I’ve run before this was 50 miles, so I wasn’t fully sure what to expect – just break the race down into check points. 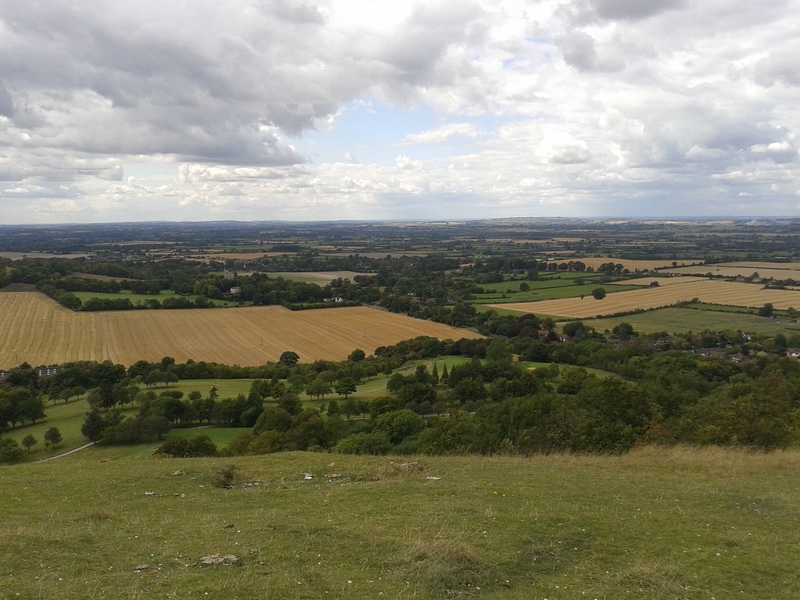 The going was really good and before long we were in Wendover which led to a long walk up to Coombe Hill and the Boer War Memorial, which commands some stunning views and you can also see Chequers – the Prime Minister’s country residence. The check points came and went and the food available was incredible and the volunteers were absolutely amazing, they couldn’t do enough for you. In the early stages I’d really made a point of not sitting down – beware the chair, being a bit of an ultra maxim. Sadly, that wasn’t to last as will be seen. I was feeling very good in the early stages. I bumped into Neil Thubron again and ran with him for a while until I couldn’t keep up with him any more. The sky began to bruise and there followed a very heavy rain/hail shower. It cooled me down quite nicely to be honest and it didn’t last long. There was a lady I kept seeing at different points in the race who wasn’t running, but she kept encouraging me – thank you, whoever you were! 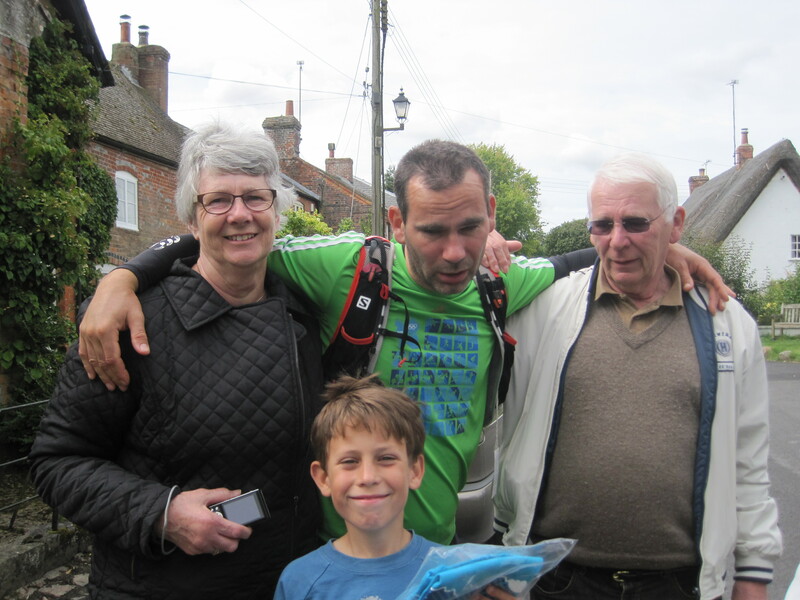 I met her again just before the Watlington Check Point which marked the marathon mark. My legs felt a bit sore at this point, but I shoved a jam sandwich down and got going again. 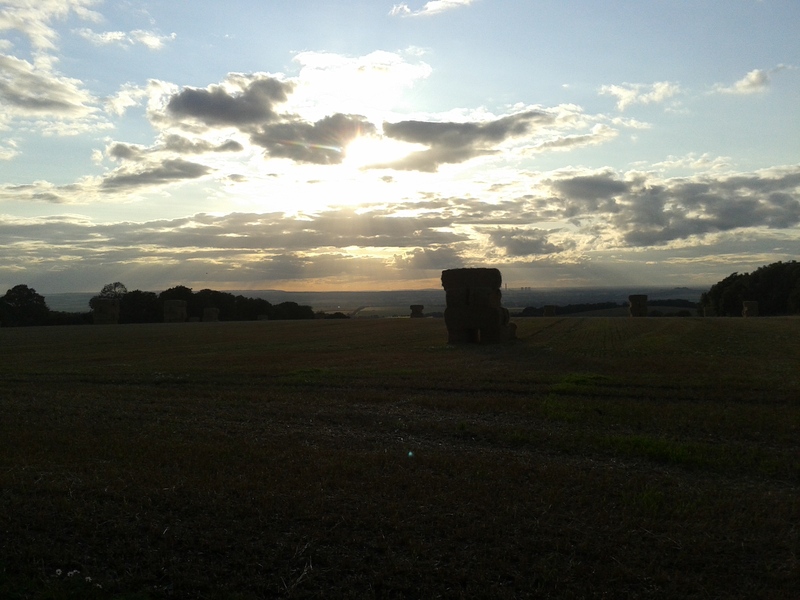 I was trying to get to Goring – the mid-stage – before dark. 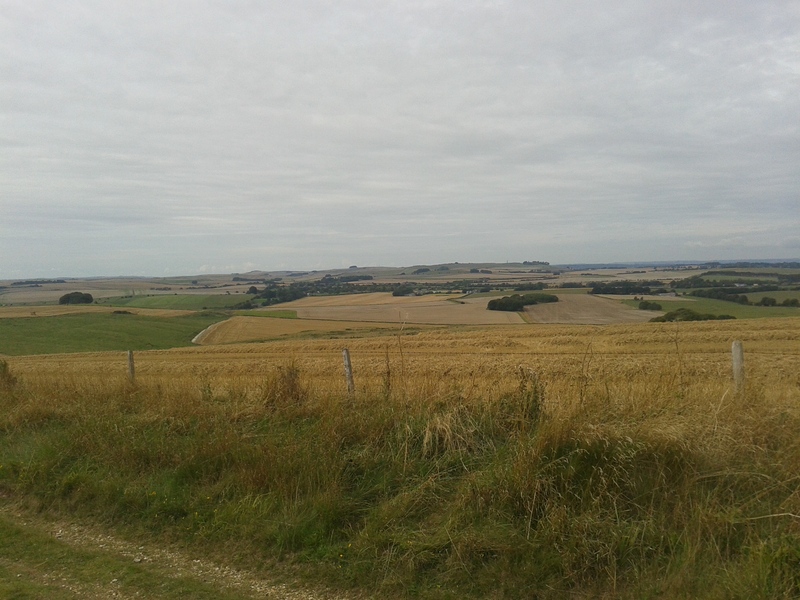 I don’t know where I was, but there was a particular place where Didcot and the White Horse Vale came into view, which was a great psychological boost. I used to dislike the cooling towers, but I now appreciate them as a landmark, so it seems a shame to see them go. Thankfully they’ve been immortalised by the Didcot Runners as their logo! The weather cleared again and I went up a hill then down towards Grim’s Ditch. There was a part where the trees were quite low and formed a canopy and I disturbed a sparrow hawk at this point – I could see it flying in the canopy for quite a way before it found a gap, what a graceful bird, beautiful. It’s a nice long downhill to Grim’s Ditch and I really enjoyed this part. Just running. Grim’s ditch was done and the next stage was to head for the Thames, which was flat calm when I reached it. 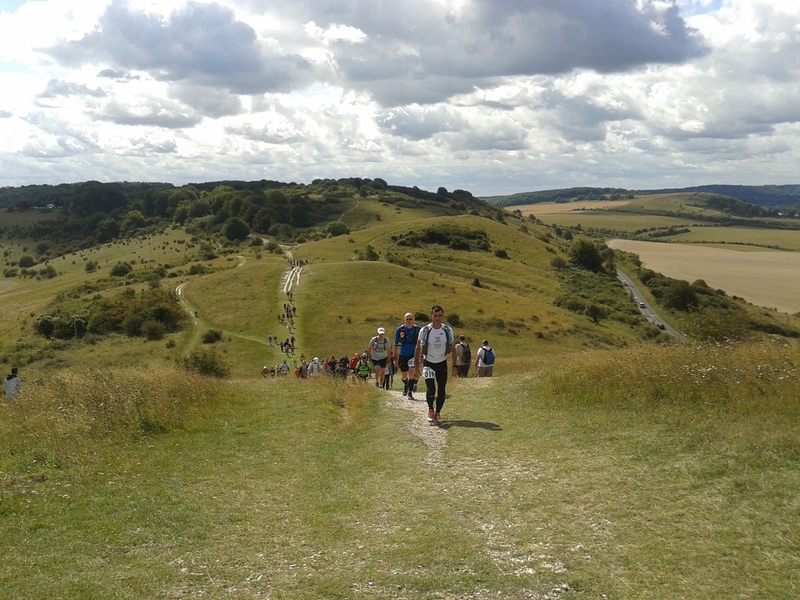 I met up with a runner here with a retina-burning orange cap and chatted with him into Goring. Losing the light. 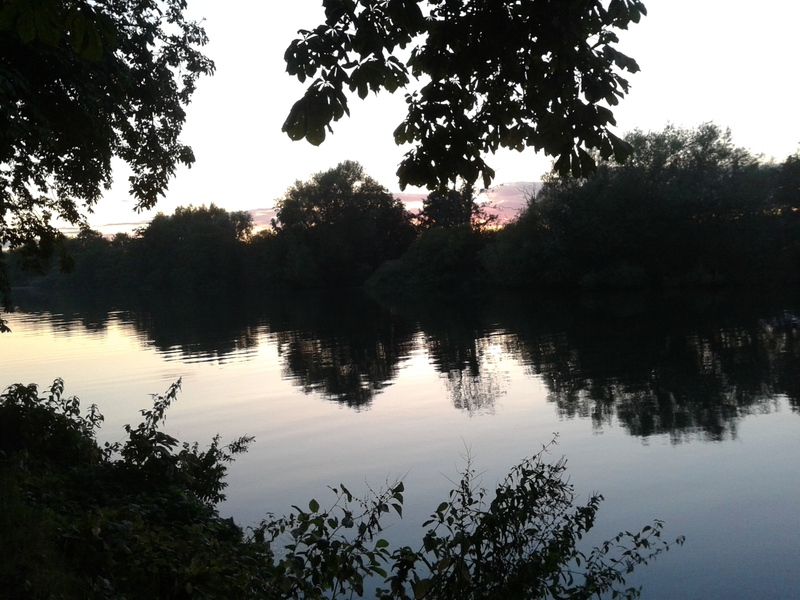 The Thames, getting close to Goring. How many times can you praise the volunteers in one blog? Not enough! 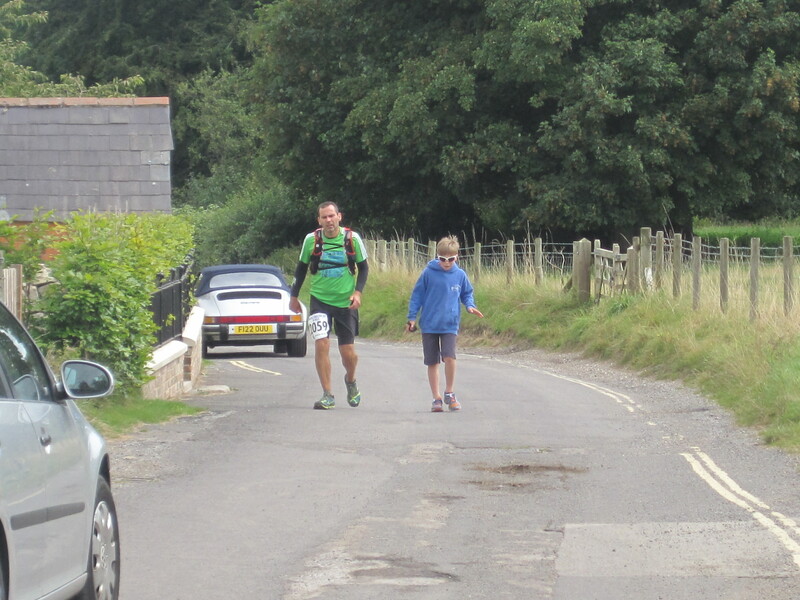 We reached the hall in Goring and the volunteers saw us across the road and into the hall. They took us to a chair and asked us what we wanted to eat and drink. They got my drop bag for me. They just couldn’t do enough to help. Just incredible. I changed into cold weather clothing now as night had truly fallen and the next stage was up on the ridge. I left around 9ish – halfway and feeling pretty good. I decided I would walk to loosen up a bit and climbed the long uphill out of Streatley. I switched off my head torch around this part to have a good look at the stars as it was totally dark with no moon. 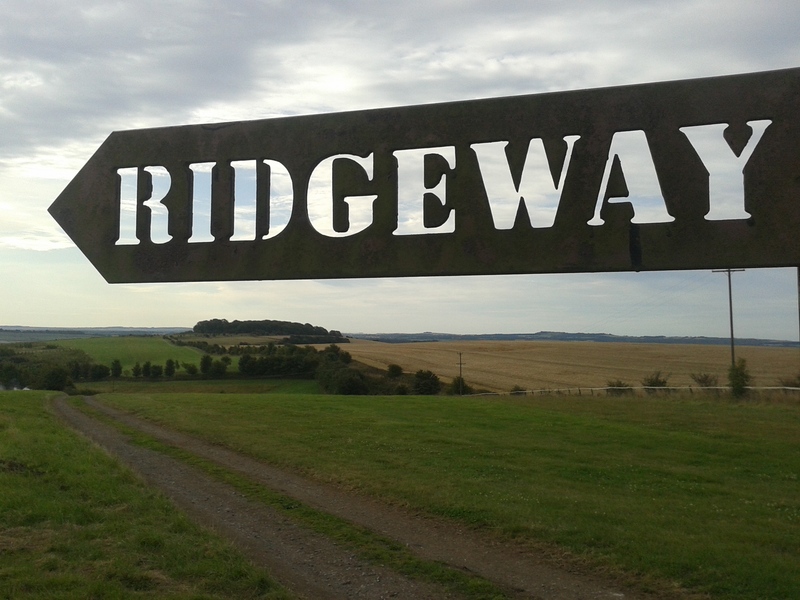 I know this part of the Ridgeway well, but in the dark, it threw me a little bit in parts, but no wrong turns, it’s just that some places seemed further to get to than I would have expected. I got to Bury Downs with another check point, but it was here I started to break a cardinal rule – the chair! I try not to sit down, but thought it okay to do so at Goring as that was inside. The check point was, again, excellent, a bit of soup and tea and away to Sparsholt Firs. I was overtaken by about four people near this point which I found a bit disheartening, but their pace seemed very quick and I couldn’t understand why they weren’t ahead of me already. I did ask the fourth guy and he said he’d taken a wrong turn. Fair enough. 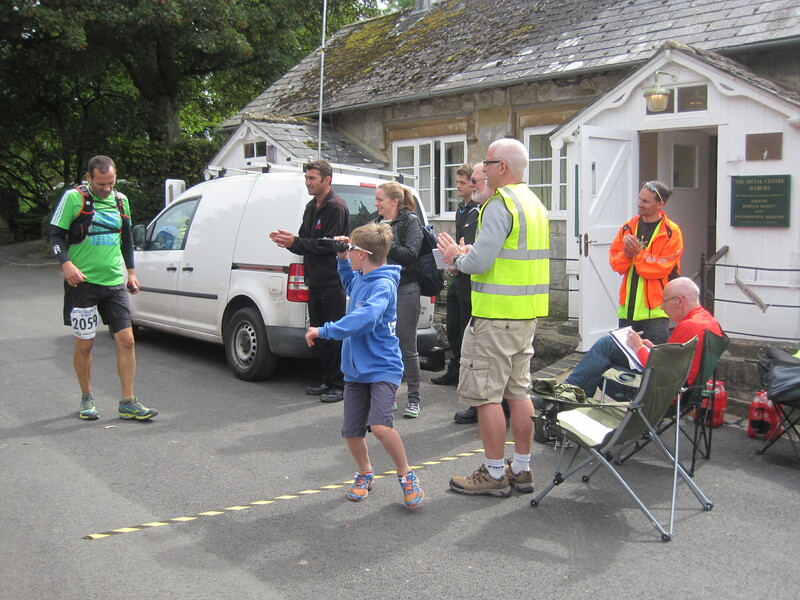 Long before I’d got to Sparsholt Firs Check Point, Nathan Montague had finished the race and set a new TRA course record to boot – 12 hours and 13 minutes, outstanding and a massive congratulations to him! So, I sat down again at Sparsholt Firs. More food and tea and thank yous and off I went to my own back yard where I regularly train. I felt very good here and went for it – well as far as going for it is for me. Bad idea. I should have kept my discipline and kept a slower pace. I walked up Foxhill to the check point and my quads really started to seize. I sat down again which really was the biggest mistake, but what could I do, I felt I really needed to rest. It was cold up on the top and I think getting out of the chair really put paid for me. Another kind volunteer walked out with me and wished me luck. I walked down hill and felt like my legs were loosening up, so started a bit of a shuffle. 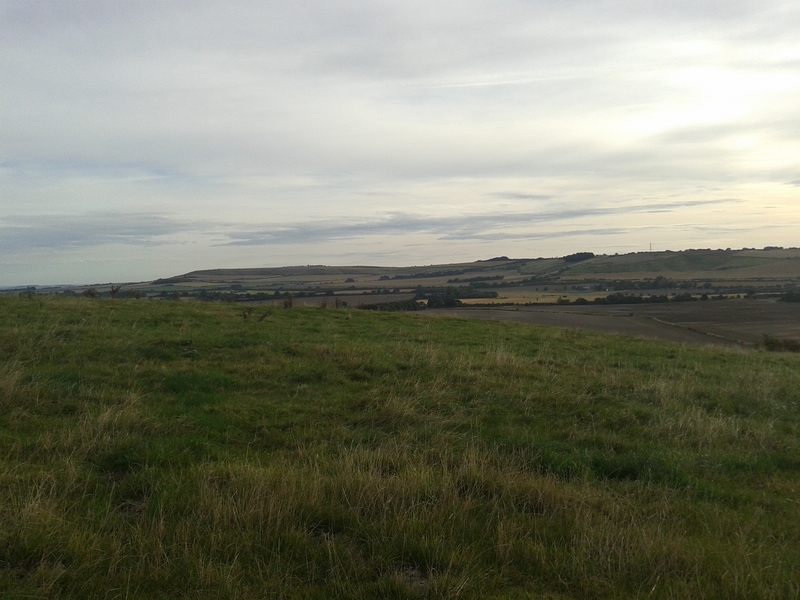 I crossed a road and started the ascent up to Liddington Castle and felt the top of my left quad tighten. I’m assuming I’d torn a hip flexor, but who knows? 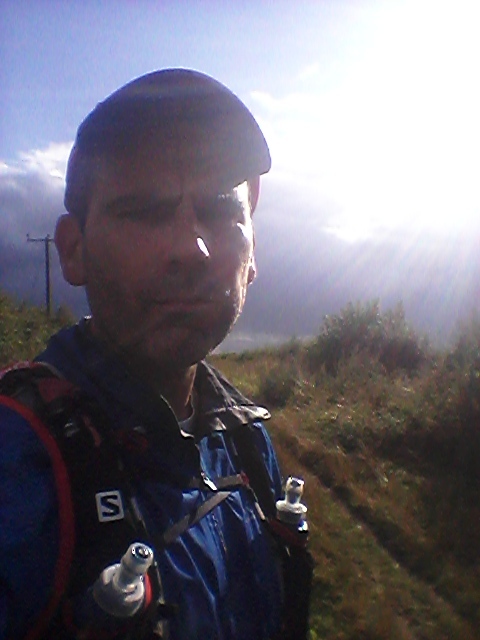 Daybreak was just kicking in here and I thought, well, 16 miles to go, 3 miles per hour is the average walk, shouldn’t be too bad….For the record, it took 7 hours 15 minutes to finish for the last 16.miles, which equates to just over 2 miles per hour! So a briskish walk turned into a slower and slower waddle to hobble. I sat down again (you’d think I’d learn) at the final check point at Barbury Castle. They were supportive and wished me well. I thought I couldn’t move at all when I got up, but managed to move. On leaving the check point I went one way, but there was a grass bank about a foot high, so I went another way that was flatter. Coming down the other side of Barbury Castle must have taken a good half hour. I was, by now, trying to lift my left leg by going on my right leg on tip toe and swinging the left leg through. Thankfully nothing was blistered. I phoned my wife to say I was on my way but “may be some time”. My mum and dad would be at the finish as well. A very nice couple in a camper van offered me a cup of tea on Hackpen Hill, but I declined for fear of seizing up altogether. Avebury. It would take the best part of an hour to get there. Towards the very end of the Ridgeway it is very badly rutted. To demonstrate why this was so, a 4×4 came chugging toward me, bouncing in and out and augmenting the ruts. It took me ages, just to hobble out of his way. I felt like giving the driver some abuse, but a quick glance suggested the six foot high and wide brick house wouldn’t take too kindly to it. On top of which my ability to run away was somewhat risible – the driver would have had time to stop, wash his hulk of a car, check his oil and tyre pressure before walking very slowly over to me to punch my lights out. Saying that, if he’d punched my lights out, I’d not be in pain any more. And so off the Ridgeway I sped – like a snail who’d had a large Christmas dinner with three helpings of pud and had decided to sleep off his dinner on a comfy sofa. I can’t remember how long I’d got, maybe forty minutes, before midday, which is what I was aiming for. To add to my woes a number of farm vehicles drove down from a field, so I had to get out of their way as well. A pained expression on my face may have been mistaken for a dirty look as one of the vans stopped, but I think the driver realised very quickly as to what state I was in. He asked if I wanted a lift? The temptation! Oooooh the temptation! If you’ve read this far, then well done, but I’ll digress a little here if you don’t mind. I once saw a programme about SAS training where the general public were invited to have a go if they thought they were hard enough. There was one point where the participants were “captured” and put through sleep deprivation which involved being on your tip toes and stretching to a wall with white noise going on in the background. The “prisoners” were then taken to a room for questioning, but they had been told only to answer certain questions. Most people survived a few rounds of questioning, but after a while something was put on the table which cracked most of them – they were told that if they gave information, they could have….a bacon sandwich! Well, the offer of a lift was my bacon sandwich. I stood up straight and puffed out my chest (hmmm…) and replied “No thanks, I’m a vegetarian!” He drove off. The word “idiot” may have been heard, but it could have been a crow singing an aria for all I could tell at this point, pain and fatigue had started to fug the mind..
Closer and closer to midday and I could now see my eldest son and wife near the first set of Avebury Stones. Hobbling, hobbling. Attempting a quick hobble, but nope, back to slow hobble. Crossed the road and there was a finish line on the ground. I could now hear a clock bell chiming dong….dong…dong and I was there. Bang on 24 hours exactly. Cue the waterworks! Nappy and dummy for Mr Stillion. My mum and dad, children and wife were all there. My son had filmed a bit of the end and I could hear him asking if I was crying because I was happy or in pain. My other son said that I was crying because I was happy AND in pain. A lady from the last check point had come to the finish and congratulated and hugged me and said how worried they all were when I’d left. The hardest, longest, two metres of my life! I was desperate to sit down but it was too painful. I ended up lying in a heap on the village hall floor, trying to eat a bacon sandwich and sip a cup of tea sideways. And then I couldn’t get up again. The medics helped me up and my wife pulled round the car and I flopped in. No idea how I got out of the car when we got home. Compare this photo with the start! So, that’s it. My first 86 miler. I finished because it was my first race at that distance and my family were at the finish and my son had given me kind words before the start of the race about not giving up. So that’s why I carried on. In hind-sight, it was extremely stupid to have done so and as much as I don’t regret my actions, I won’t do that again. I don’t see the point in doing long term injury for the sake of it. Amazingly, I did loosen up by the next day, but still in a bit of pain. I also felt pretty nauseous. On the good side – no chafing, no blisters either and a cracking t-shirt! I cannot thank everyone involved with this race enough. From Tim Mitchell the RD, every aid station volunteer and all the back room staff who kept the machine very well oiled and updates, well, up to date. And finally. My family. Thank you for being there.